Anthony's Pier 4 Cafe is one of five restaurants in the family of Anthony's Pier 4 Restaurants. Anthony's Pier 4 Cafe offers many of Anthony's award-wining classics such as Maine lobsters, prime steaks and the freshest New England seafood along with newer, more innovative fare. The Tavern menu includes lighter items such as custom-designed pizzas, sandwiches and an eclectic assortment of fresh salads. 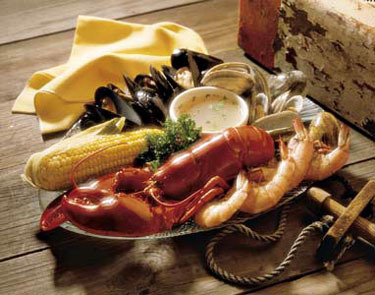 Enjoy a wide variety of Raw Bar selections in either the Dining Room or the Tavern. Anthony's Pier 4 Cafe, on the water's edge, offers a striking view of the Boston skyline beyond. The restaurant maintains a nautical theme with models and paintings of ships throughout, and sunlight streams through the many glass doors and windows. There is an outside deck as well as a sunny, glass-enclosed dining area. Anthony's Pier 4 Cafe offers diners a modern, casual feel with its hardwood floors, white bead board walls and mouldings, exposed brick and granite countertops.